Melvin Robertson lacks an appropriate voter ID under a recently enacted Wisconsin law. 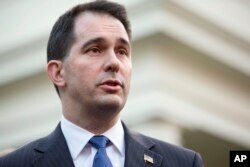 FILE - Under Governor Scott Walker, Wisconsin has implemented a strict voter ID law. "The reason why this law was changed, that we now have to show a photo ID, is to stop people from voting – plain and simple," said Johnson, an activist with Our Democracy 2020, a coalition of Wisconsin good government and pro-democracy groups. "It affects senior citizens, it affects students, it affects the low-income [people]. It affects people of color." Redistricting has contorted Texas' 35th Congressional District. Republican Larry Gonzales, who serves in the Texas House of Representatives, defends the redistricting effort led by his party. (J. Swicord/VOA). 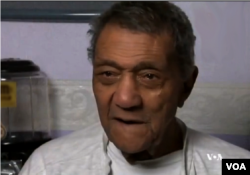 "Back then, you had to pay poll taxes to vote. I remember going with my dad and [him] voting for John F. Kennedy and paying $2.50" – a hardship when he was earning $1 an hour and supporting a family of 10, Renteria recalled. "But he was determined to vote." Chris Simkins and Jeff Swicord reported from Georgia, Texas and Wisconsin. Carol Guensburg reported from Washington.